Cast your minds back a bit. The first Omnian stamps were 1 Ob<u>a</u>1, hastily corrected on a follow up issue. Then way, way back there was a discrepancy regarding Űberwald. While the Bad Blintz stamps were valued in Bizots and the Bonk stamps in Bizlots. This had resolved back to Bizots when Űberwald issued stamps in its own right. Now there is another discrepancy. The 1T sheet from the YotTR tells us that the T was for Talon. But for this year’s issue the T is for Talent. In the absence of an explanation I would favour Talon. Wisely, the Discworld Catalogue sits on the fence on this issue. When I set up the new stamp page I had entered Talon as the denomination. It was only when I was updating the sheet page that I realised it said Talent. I type what is there. I can only assume that advertising money from the hit show Djelibeybi's got Talent had something to do with the name change. steeljam wrote: When I set up the new stamp page I had entered Talon as the denomination. It was only when I was updating the sheet page that I realised it said Talent. Muba wrote: So which is correct? The catalogue shows the denomination shown on the sheet, be it Talon or Talent. It is not unknown for a currency to change. The UK currency went from Shillings and Pennies to Pence; France went from Franc to Euro, Germany from Mark to Euro, etc..
Now, this is interesting. The early stamps were created/imported from the spreadsheet. I have checked the sheets and have found an early one referring to Talent and a later one referring to Talon. Emails at the time (2008) advise the issue as Talon. Things were pretty hectic when I started to set up the website. 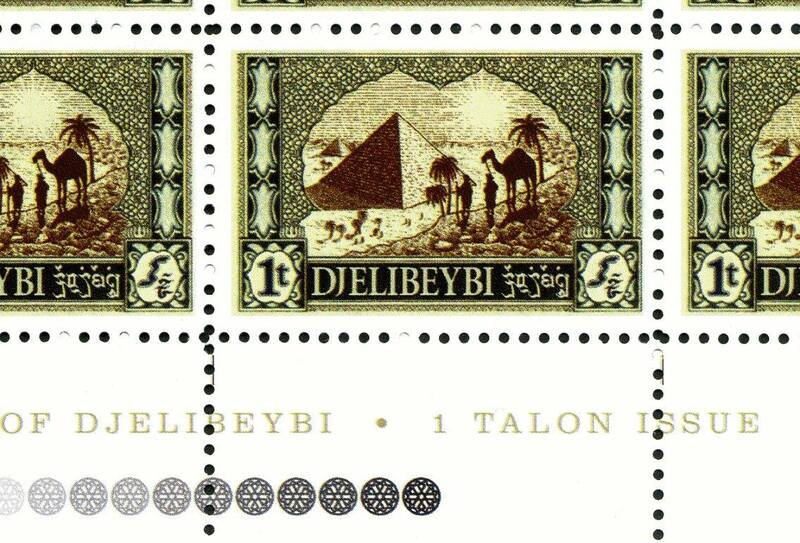 The 1T Djelibeybi stamp currently designated shs-dj0138 was originally designated as shs-dj0124. Errors may have been made in transcription. I am wondering if the author of the new stamp used the catalogue to determine the denomination of the new stamp. "IIa gave a snort and grabbed his own abacus. The Talon stamp was before my time, so I can't really shine a light on that, but as it was approved by Terry it too has verisimilitude. The Discworld MUD lists both Talents and Talons as being in circulation in Djelibeybi (along with Toons, Ras and Thanras), though I don't know from where this information was gleaned! VERY interesting. My philatelic / flatelic frosset pouch has been pleasantly wibbled. phalarope wrote: VERY interesting. My philatelic / flatelic frosset pouch has been pleasantly wibbled. My word, has it? I'm not sure what a frosset pouch is, or whether I'd enjoy it being wibbled, if I had one, but I'm intrigued . . . is that the sort of thing The Emporium charges *extras* for ? We still do not know how many Talents or Talons make 1 Ptascp!